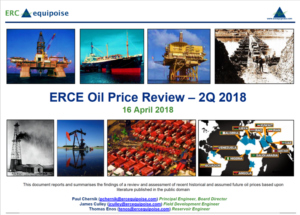 We’re pleased to announce the Q2 2018 ERCE Oil Price Review is now available. This quarterly report, which ERC Equipoise has allowed TAG Oil to share with its investors, provides oil market fundamentals and trends, as well as a look into oil price assumptions presented by ERCE and other petroleum consultants, analysts and agencies. We are happy to offer this report to our shareholders with the permission of ERC Equipoise. Enjoy.